In this article, we’ll show you some of the most important settings you should configure immediately after you’ve installed WordPress. We won’t cover every setting WordPress has to offer (that would take a lot more than a single article), but we’ll discuss the most vital options. Let’s get started! The first thing a brand-new WordPress website needs is a great name. 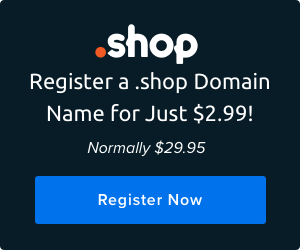 You probably already have a domain set up, so you know what you want to call your website. To change your site’s name, you need to access your dashboard and jump to the Settings > General tab. Right at the top of the screen, you’ll see two options, one to change your site’s title and another to alter its tagline. If you visit your homepage, you’ll notice that both the title and the tagline appear at the top of your browser, on the tab where the page is open. Your tagline can be anything you want it to be. Many websites use mottos or include a short description of the type of content you can find within. Other websites don’t even use a tagline, since your site’s tabs can look cleaner without one. Once you’ve made your edits here, scroll down to the end of the page and look for the Save Changes button, and then click on it. The same applies to all of the following tips — be sure to save each tweak to your WordPress settings before moving on to the next. Next up, you can configure the way WordPress deals with new users. To do that, return to the Settings > General tab. This time, scroll down until you see two settings that read Membership and New User Default Role. That first setting lets you turn user registration on or off for your website. By default, new users can’t register, and you have to add them manually, so feel free to turn this setting on. If you want users to be able to comment on your posts, this can be a necessary step. As for the New User Default Role setting, if you open the list next to it, you’ll notice that it includes five options: Subscriber, Contributor, Author, Editor, and Administrator. The default role for a new user is Subscriber, which only enables them to edit their profiles and comment on your website. Each subsequent permission level gives the user more options. For example, Contributors can write and save posts but not publish them, whereas Authors can do all three. Editors can write and publish their posts, as well as those created by other users. Finally, Administrators can do just about whatever they want. At this stage, you should be the only person with administrative privileges on your website. At some point, you might want to add new authors and editors, but we recommend that you don’t give admin access to anyone else unless you’re co-running the website. As for which role you should choose for new users, the default (subscribers) is typically the best option. Now that you’ve configured the settings for other users, you still need to check out your own profile options. To do that, you’ll need to step away from the Settings tab and over to the Users > Your Profile section. There are many settings you can play with here. For example, you can turn off the WordPress visual editor while you’re writing, or disable syntax highlighting for code. Both those features are pretty useful, however, so we recommend not disabling them. Below that, you’ll see options to change your dashboard’s color scheme. Feel free to use whichever combination strikes your fancy. Moving on, you can also enable a feature that turns on keyboard shortcuts for comment moderation, which can come in handy if you have many users. There’s also a setting that enables you to hide the toolbar when you’re viewing your website while logged in. Finally, you can flesh out your user profile by adding some personal information, including your full name, nickname, contact information, and even a short bio and avatar. If you look at the bottom of the screen, you’ll notice that there’s also an option to generate a new password, which we recommend you use from time to time for security reasons. WordPress will automatically generate a secure password for you, but you can use any combination you want. As always, remember to save whatever changes you’ve made before moving on to the next section. For this section, we’re going to take a look at your default post settings, which you can find under the Settings > Writing tab. There are two post-related options you can play with here: Default Post Category and Default Post Format. The first one enables you to configure which category your new posts will fall into by default. Right now, there shouldn’t be any options here. You can go ahead and set up your first category by navigating to the Posts > Category page. To the right, you can see a list of your existing categories, and you can set up new ones using the menu to the left. 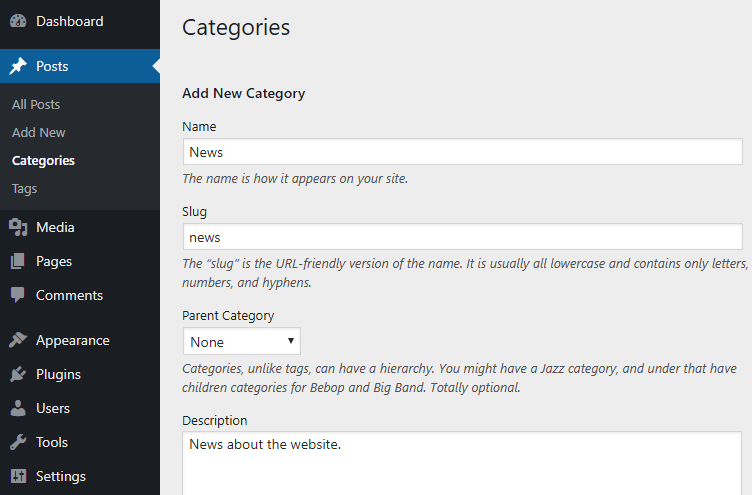 All you have to do is pick a name for your category, set a parent for it if you want, and create a brief description. Once your new category is ready, return to the Settings > Tab screen, and you can choose it from the Default Post Category options. Now, let’s take a look at the Default Post Format options. The format you choose will impact the way your posts look. As you can see, there are a lot of potential formats. If you are mainly creating news or blog posts, however, we recommend you stick with the Standard option. Plus, you can set different formats for individual posts while editing them, so you’re not stuck using a single option. By default, WordPress will set your home page to show a collection of your latest posts. However, you can change this setting, so your website uses any page you want as its main portal. To do this, go into the Settings > Reading tab. At the top of the screen, you can see what your homepage options are. Right now, WordPress will display a list of your most recent posts, but you can switch to the A static page option and pick one from the list below. Since your website is brand new, you probably don’t have any pages set up right now. Take note of how to make this change, however, so you can assign a static homepage later on if you want to. If you look below that section, you’ll see that you can also configure how many posts should appear on each of your pages (and in your RSS feed). You can also decide whether the post’s full text will show up, or just an excerpt. Unless you’re writing really short blog posts, we recommend going with the Summary option, so that your pages look cleaner. Plus, this way people will have to click on each of your posts to read them in full. Blog comments are one of the best ways to engage with your site’s visitors. Once you enable user registration (which we covered earlier), users will be able to comment. However, there are some related settings you should take a look at before you start publishing content. To find WordPress’ comment options, go to the Settings > Discussion tab. You should see a section called Default article settings directly at the top. Here you can disable blog comments altogether, using the third option. If you scroll further down, you’ll see a section called Other comment settings. Within, you can specify whether users need to be registered and logged in to comment. You can also force users to enter a name and email before they can leave a message. Those are the two most important options in this section. However, there are a few more settings you might be interested in. For example, you can automatically close the comments sections on older articles, enable nested comments, and turn on pagination for long threads. Unless your blog is exceedingly popular, you shouldn’t need to turn on pagination. However, enabling nested comments is an excellent idea, since it helps users keep track of discussions among themselves. You should always use high-quality images on your website. No one wants to look at pixelated photographs, and using strong images can make your content much more engaging. The problem is that the better your images are, the larger their resolutions and file sizes will be. You can tackle this problem with WordPress by setting maximum image resolutions. That way, when you upload an image, WordPress will resize it and generate multiple versions in different sizes. To do this, go to the Settings > Media tab, and you’ll see three sets of sizes you can tinker with. The dimensions here are set in pixels, so keep that in mind if you want to make any changes to the defaults. In our experience, the default sizes for thumbnails and medium-sized images are sufficient for most users. However, you may want to increase the Large size dimensions a bit, depending on what type of images you plan to display on your website. That’s the default permalink structure WordPress uses. It works, but it’s not very informative to anyone viewing the link. This is why we recommend that you change your URL structure as soon as your site goes live and before you start publishing content. Let’s go ahead and do that now. Head to the Settings > Permalinks screen, and check out the options within. There are six permalink structures you can choose from, including a custom option. In our experience, the Post name permalink structure is usually the best option, since it gives readers a clear idea of what the page is about. If you like to keep things organized, you can also consider using the Day and name or Month and name options, both of which add dates to your content’s URLs. 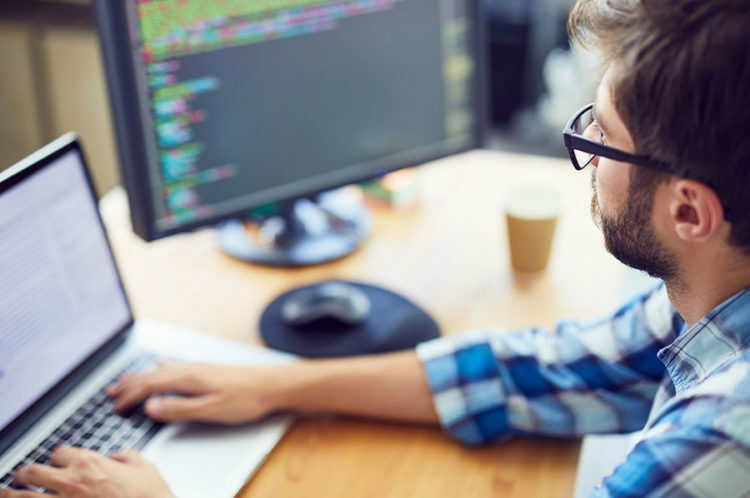 Keep in mind that you won’t want to change permalink structures again down the road, since that can negatively affect your Search Engine Optimization (SEO). With this in mind, take your time and make sure to choose a structure you feel comfortable with. Favicons are the little images that show up to the left of your site’s title and tagline in browser tabs. When you set up a new website using WordPress, it won’t have a favicon by default. This looks a little boring, but you can quickly fix it by going to the Appearance > Customize tab. On this page, you can play around with your website’s style and instantly check out how any changes you make look. There are many options here, but for now, let’s focus on your favicon. To upload a new one, click on the Site Identity tab and look for the Site Icon option. All you have to do is upload the image you want to use as your favicon, and WordPress will show you how it will look. Once you upload an image, the changes will be saved so you can leave the customizer straightaway (or stick around and tinker with it for a while). We’re almost done now, but there’s one more thing that may need to be done. In a lot of cases, when you launch a new WordPress website, it will include several pre-installed plugins and themes you might not want to use. You can just keep those plugins and themes inactive, but removing them entirely is a better way to keep your site tidy. To do that, go to the Plugins tab and take a look at what’s inside. Simply go through the list of plugins here, and decide which ones you’d like to keep and which should be removed. To delete a plugin, you’ll first need to Deactivate it. Then, a red Delete option will show up under its name. WordPress will ask you to confirm if you want to delete the plugin. If you say yes, it will be removed from your site. To delete unused themes, you can move over to the Themes tab. Just click on a theme you don’t need, and look for the Delete option in the bottom-right corner of the resulting window. Once again, you’ll need to confirm your decision. With that out of the way, you’re ready to start working on your site’s content! For a brand-new website owner, it can be hard to figure out what to do next after installing WordPress. There are plenty of options and settings to dig into, but you need to understand which are most important before you can properly set up your site. Do you have any questions about configuring your WordPress settings? Join the DreamHost Community today and let’s start the conversation!